Conitec's GALEP-4 is a universal device programmer of pocket-sized dimension. The programmer supports EPROMs, EEPROMs, FLASH EPROMs, serial EEPROMs, Microcontrollers, GALs and PALCEs, handling up to DIP40 devices without requiring any additional adapters or circuitry. It's connected to the PC through the parallel printer port. For even more performance a version with 48 pin drivers and USB2 port is available (GALEP-5). By using a highly integrated FPGA, GALEP's internal logic is freely programmable and automatically optimized for the selected component. This way all components can be both written and read at optimal speed. The Galep-4 OS features a comprehensive set of basic functions such as read, program, compare and delete, along with easy-to-use custom configuration options for any special functions required by the selected component. Using batch commands, the user can also access the programmer from within their chosen software application (e.g. Visual Basic). The Galep-4 software includes the ability to constantly incorporate support for additional devices (current device list) through free software updates offered on our website. We develop new components on a monthly basis, and any Galep-4 owner can implement these by downloading software updates from the internet. This feature allows the GALEP-4 to remain at the cutting edge of industry standards for years to come. If you need a certain device that's not yet supported, use our free Device on Demand Service. Galep owners have life-time free access to the updates. Prior to each function, GALEP-4 checks the electric selected device's electric consumption, as well as the correct positioning of the selected component. This reduces the risk of accidentally harming the component or the programmer to a minimum. 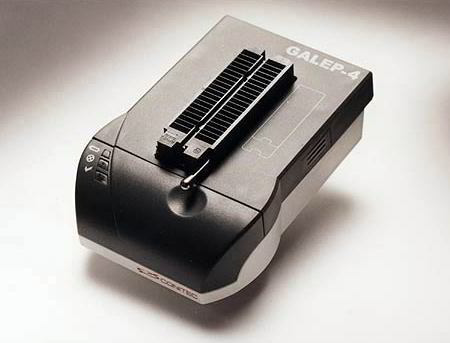 The GALEP-4 carries a separate universal pin-driver for each of the 40 socket pins. A special pin driver IC guarantees precise current control and perfect waveform integrity. GALEP-4's pin driver design corresponds to that usually found in far more expensive programmers. Low-Voltage GALEP-4 pin drivers feature true level-shifters and comparators, guaranteeing clean signals right down to 1.3 volts. The Galep-4 comparators allow measurement of the voltage on any of the 40 pins within a range of 0 to 25 volts with a precision of 100 mV. This can be used to precisely determine high and low levels at the component's output pins. By using a highly integrated FPGA, GALEP's internal logic is made freely programmable and is automatically optimized for the selected component. This way all components can be both written and read at optimal speed. Dual power: AC adapter or 6 rechargable NiMH batteries (AAA). Socket converters available for most component packages. Along with conventional external power, the GALEP-4 is configured for use in the field, with six NiMH rechargable batteries, allowing up to 24 hours of continuous operation between charges (batteries not included). Parallel printer port or PCI / Express printer card. Please note: parallel port device programmers control the timing via software and thus require a 32 bit operating system. For operating GALEP-4 on a 64 bit Windows PC you have to use a virtual 32 bit OS, f.i. VMWare with XP-32. Price plus VAT. Warranty: 24 Months. CE and RoHS certified.